Are the words on your computer screen looking fuzzier than they used to? At Ritz Eyecare, we can help. 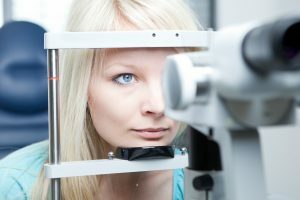 We are happy to be many patients’ preferred optometry office in Ocala, Florida—a title that we strive to live up to daily by providing an extensive range of products and services aimed at helping people get their best vision possible. Visit our eye glasses boutique to see just what our eye doctors can do for you. For more than 25 years, we have been serving people throughout the community. Our goal is to provide accurate, high-quality treatment in a friendly, welcoming atmosphere. Our board-certified optometrists are happy to answer any questions you have, explain warning signs of certain eye diseases, and help you choose the eyewear that works best for you. Don’t think about glasses as a burden—think about them as accessories. Some people dread getting new glasses because they think they won’t look good in them. However, we have a wide selection of products in different shapes and colors to fit virtually any style. To make the selection process even easier, the staff at our optometry office helps you narrow down the selection based on your preferences. We’ll help you choose a flattering shape and pull a few samples to see what you like. At our eye glasses boutique, you can also double your style choices by getting two pairs of glasses for the price of one. Simply purchase one pair from our regular collection and select a free pair from our special collection. Ensure your eyes remain healthy throughout your lifetime. Without proper vision care, your eyes could deteriorate without you even realizing it at first. However, once we get you the right prescription or treatment, your eyesight can stabilize and, in some cases, even get better. Start your journey to better eye health by talking to one of our optometrists. You’ll be able to know if there are any problems and what the best steps are in correcting them.